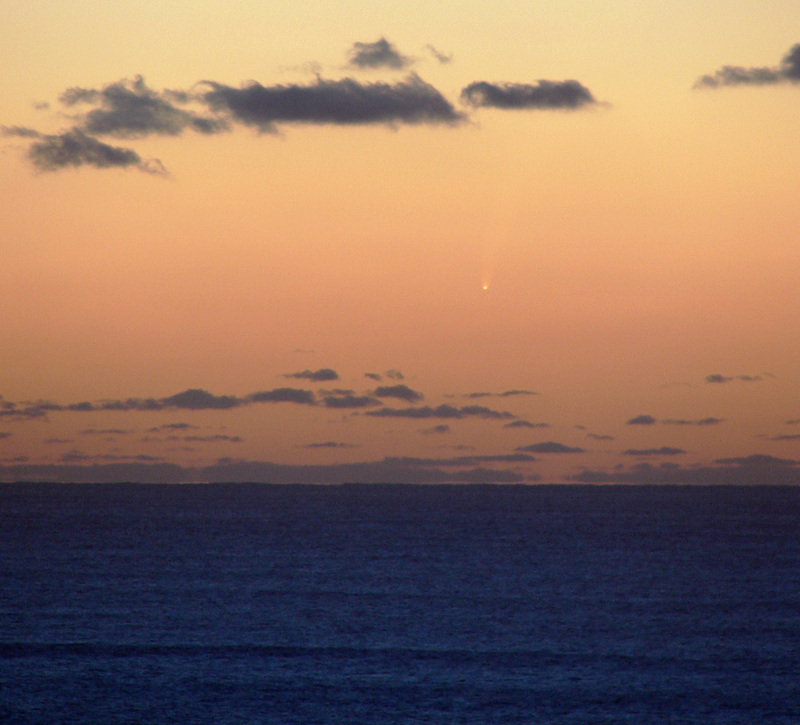 I was able to view Comet C/2006 P1 (McNaught) from an overlook about 1/2 mile south of Beverly Beach, north of Newport. I arrived before sunset, which occurred at 4:59pm PST. After the sun set, I was a bit disoriented at first and couldn't find Venus. I had assumed that the bright planet would be my signpost to the comet, which was about 14 degrees to the right and 7 degrees down from Venus. 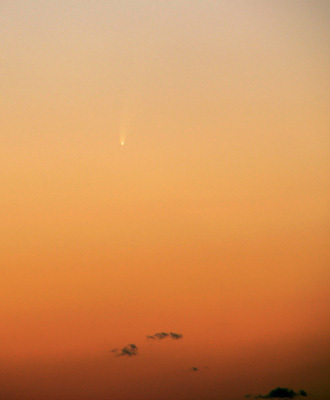 However, when I swept upward from the sunset point with my 8x56 binoculars at 5:03pm, I immediately saw the comet. The comet had a bright coma and short tail even in the bright twilight. The pseudonucleus appeared stellar, with a parabolic coma leading into a tail that was brighter on the outside edges and in particular brighter on the southern edge. 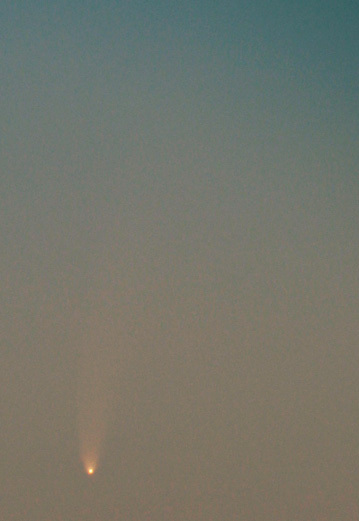 When I tried to see the comet with my naked eyes at 5:09, I found it very easily. I concentrated on taking pictures with my digital camera, and finally got the comet to show up (although I tended to overexpose a bit). The view improved for a while. Tail length was about 1.5 degrees with a gentle curve to the right. The comet was strongly reddened as it sank lower, but it was still an easy naked eye object. 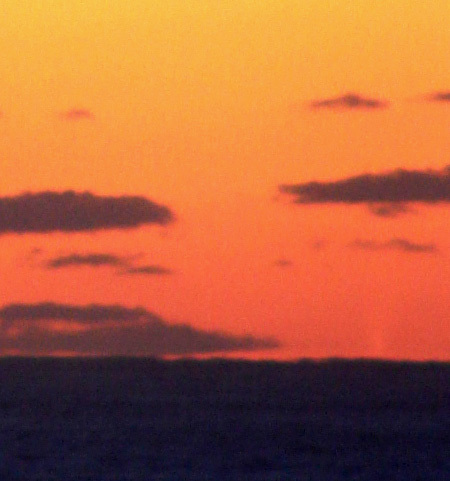 In the binoculars, I was able to follow it right down to the ocean. The distorted coma seemed to hang on the horizon for a bit in a wave trough, possibly with some mirage or reflection effects. 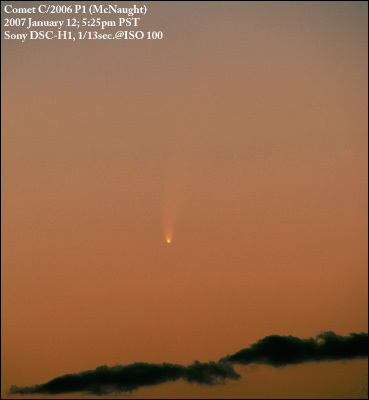 The tail was visible briefly after the coma set (around 5:38pm) and before some small clouds covered it up. 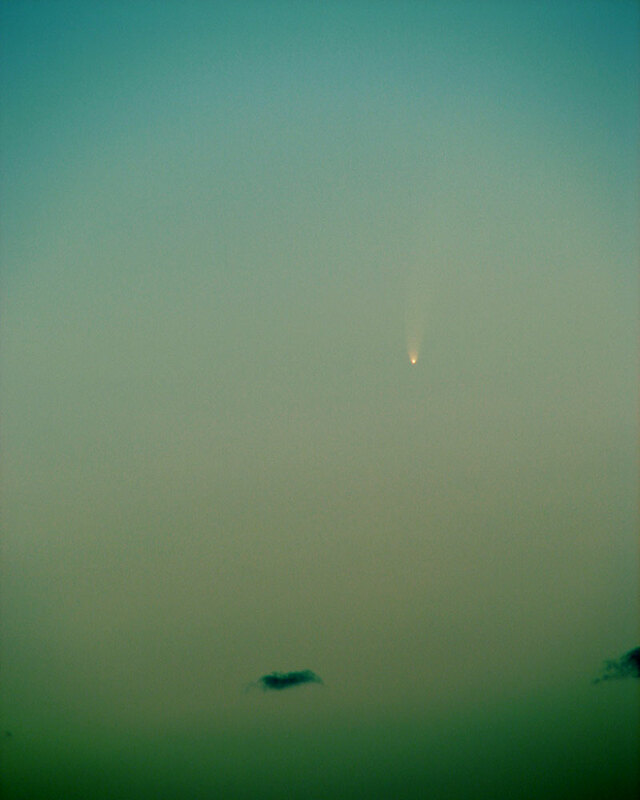 5:19pm: A comet in bright twilight! 5:33pm: Falling toward the ocean. 5:38pm: Only a bit of tail remained. Photo details: All photos copyright 2007 by Wes Stone. Taken with a Sony DSC-H1 at 72mm focal length. 1.7x teleconverter used on second and third photos. Processed in Adobe Photoshop Elements 4.0.